Mogadishu (HAN) June 16, 2014 – Canada’s first Non resident ambassador in Mogadishu submitted his credential letters today to Somalia President Hassan Sheikh Mohamoud in Mogadishu Palace. Canada hasn’t had an ambassador accredited to Somalia since 1990 but had signalled it wanted to rekindle relations following presidential elections in Somalia 2013. David Angell, as an Ambassador to Somalia will replace officialy somali files, Anita Raynell Andreychuk, her last term ended in August 1990. In 1985, Andreychuk was appointed associate deputy minister of social services in the province. Two years later, she was named Canada’s High Commissioner to Kenya and Uganda and ambassador to Somalia and the Comoros before becoming ambassador to Portugal in 1990. She was also named, the same year, as Canada’s permanent representative to the United Nations Environmental Programme and the United Nations Human Settlements Programme. Soon after the announcement last year, Ambassador David Angell took to Twitter to convey his excitement about the new position to link Somali diaspora, Somalia and Canada. 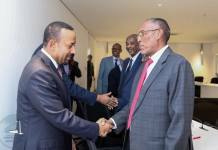 Ambassador Mohamed Ali Americo: Congratulations to Ambassador David Angell, Canadian Ambassador to Somalia, who today gave his credentials to President Hassan Sheikh Mohamoud. Meanwhile, Ambassador Angell was appointed Canada’s ambassador to Kenya last fall and he’ll continue to live in Nairobi while carrying out his new duties. Canadian Eye on Africa’s director, Nour Kaafi, issued a statement expressing Afro-Canada’s diaspora enthusiasm about the nomination. “Somalia looks forward to working closely with ambassador designate Angell to continue to build on the strong relationship with the Somalia, Somali-diaspora and advance our shared Africa-Canada priorities.” the Canadian Eye on Africa statement said. A longtime Canadian diplomat becomes the country’s first ambassador to Somalia in more than two decades, after Siad Barre. 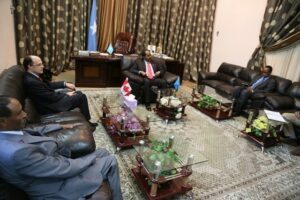 Somali president Hassan Sheikh Mahmoud has received credential letters from Canada’s new ambassador to the country Mr David Angel during a meeting at the presidential palace. 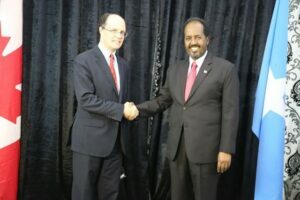 The appointment of David Angell’s as an Ambassador in Somalia marks a restart of diplomatic relations between Canada and Somalia, including Puntland and Somaliland, according to the diplomatic post status. “Mr President, I am very grateful to you for accepting my credential letters today” said Ambassador David who also delivered to the president a letter of greetings and goodwill from the prime minister of Canada. Ambassador David promised to work hard towards strengthening the diplomatic relations between Canada, canadians and Somalia through Somali-diaspora. 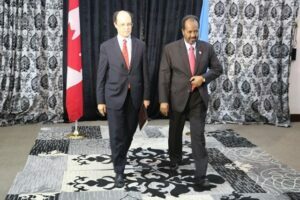 Somalia’s foreign minister Abdirahman Duale Bayle said that the arrival of Canada’s ambassador in Somalia was a clear indication that the Somalia iss emerging from decades of conflicts and hardships. 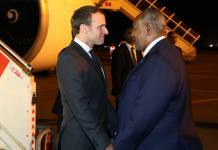 For his part, the Somali president praised Canadian government and its people for welcoming Somali refugees adding that some of them who recently returned home and are currently playing a key role in the reconstruction of Somalia. 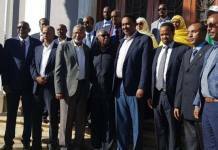 “The Somalia federal government is ready to help the Canadian ambassador to accomplish his diplomatic role in the country and we will facilitate everything for him” said president Mahmoud who wished the newly appointed ambassador to develop bilateral ties between the two nations.